What do you see? How has God equipped you recently? What do you see? That's right, it's an “Up Arrow”. If you saw one of these in real life, wouldn't you be curious? This kind of blatant sign can only be a message, but about what? The coins say to look up, or in this case, to hunt in the air until you find the object of the sign. In our bible passages of study we are going to see such a blatant sign and we will see where it points to. Let's look at Numbers 21: 1-9. Num 21:1 When the Canaanite king of Arad, who lived in the Negev, heard that Israel was coming along the Atharim caravan route, he fought against Israel and took some of them captive. Num 21:2 Then Israel made this vow in the LORD's presence: "If you give these people into our control, we intend to devote their cities to total destruction." Num 21:3 When the LORD heard what Israel had decided to do, he delivered the Canaanites to them, and Israel exterminated them and their cities. They named the place Hormah. Num 21:5 the people complained against the LORD and Moses. "Why did you bring us out of Egypt to die in the wilderness?" they asked. "There's no food and water, and we're tired of this worthless bread." Num 21:6 In response, the LORD sent poisonous serpents among the people to bite them. As a result, many people of Israel died. Num 21:7 Then the people approached Moses and admitted, "We've sinned by speaking against the LORD and you. Pray to the LORD, that he'll remove the serpents from us." So Moses prayed in behalf of the people. Num 21:8 Then the LORD instructed Moses, "Make a poisonous serpent out of brass and fasten it to a pole. Anyone who has been bitten and who looks at it will live." Num 21:9 So Moses made a bronze serpent and fastened it to a pole. If person who had been bitten by a poisonous serpent looked to the serpent, he lived. It's weird that total victory happens and then Israel is totally faithless and impatient. Things don't change much even after thousands of years. We are fragile in our minds and God has to teach us lessons. In the game, the arrow shows where to look for 3 secret 1-Up Mushrooms. God gives us second chances and many more. We just have to look to Him. As the last lesson showed, this is only the beginning. For some reason, Israel still didn't learn a whole lot. 2Ki 18:1 Now it happened that during the third year of the reign of Elah's son Hoshea, king of Israel, that Ahaz' son Hezekiah became king. 2Ki 18:2 He was 25 years old when he became king, and he reigned in Jerusalem for 29 years. His mother was Zechariah's daughter Abi. 2Ki 18:3 He did what the LORD considered to be right, according to everything that his ancestor David had done. 2Ki 18:4 He removed the high places, demolished the sacred pillars, and tore down the Asherah poles. He also demolished the bronze serpent that Moses had crafted, because the Israelis had been burning incense to it right up until that time. Hezekiah called it a piece of brass. If it weren't for an actual good king, Israel would have been still in their idolatry. Why would Israel worship creation instead of The Creator? I bet that Israel saw the miracle of the bronze serpent and thought it was magic. Unfortunately, we humans are very vulnerable to stuff like this, even if we don't realize what we are doing. We definitely need these second chances, we keep making mistakes and committing sins. God is really the only One who can keep us from falling into these traps. Even salvation itself is tied to the bronze snake, but this is only a figure head for what is really happening here. Joh 3:1 Now there was a man from the Pharisees, a leader of the Jews, whose name was Nicodemus. Joh 3:2 He came to Jesus at night and told him, "Rabbi, we know that you have come from God as a teacher, because no one can perform these signs that you are doing unless God is with him." Joh 3:3 Jesus replied to him, "Truly, I tell you with certainty, unless a person is born from above he cannot see the kingdom of God." Joh 3:4 Nicodemus asked him, "How can a person be born when he is old? He can't go back into his mother's womb a second time and be born, can he?" Joh 3:5 Jesus answered, "Truly, I tell you with certainty, unless a person is born of water and Spirit he cannot enter the kingdom of God. Joh 3:8 The wind blows where it wants to. You hear its sound, but you don't know where it comes from or where it is going. That's the way it is with everyone who is born of the Spirit." Joh 3:9 Nicodemus asked him, "How can that be?" Joh 3:10 Jesus answered him, "You're a teacher of Israel, and you can't understand this? Joh 3:11 Truly, I tell you with certainty, we know what we're talking about, and we testify about what we've seen. Yet you people do not accept our testimony. Joh 3:13 "No one has gone up to heaven except the one who came down from heaven, the Son of Man who is in heaven. Joh 3:15 so that everyone who believes in him may have eternal life. Joh 3:16 "For this is how God loved the world: He gave his unique Son so that everyone who believes in him might not be lost but have eternal life. Joh 3:17 Because God sent the Son into the world, not to condemn the world, but that the world might be saved through him. Joh 3:18 Whoever believes in him is not condemned, but whoever does not believe has already been condemned, because he has not believed in the name of God's unique Son. Joh 3:19 And this is the basis for judgment: The light has come into the world, but people loved the darkness more than the light because their actions were evil. Joh 3:20 Everyone who practices wickedness hates the light and does not come to the light, so that his actions may not be exposed. Joh 3:21 But whoever does what is true comes to the light, so that it may become evident that his actions have God's approval." Jesus says we must believe in the sacrifice that he made and then look up to Him much like the bronze serpent. However the cross itself is not the object to be worshipped, but Jesus Christ, the second person of the Trinity. Jesus is God in the Son's form–the only begotten Son of God. In the scriptures, Jesus also calls Himself the Son of Man. In life how do we spot good directions and bad directions? There are three things God will equip us with to spot good and bad directions if we look to Him first and earnestly seek. Can you name these? 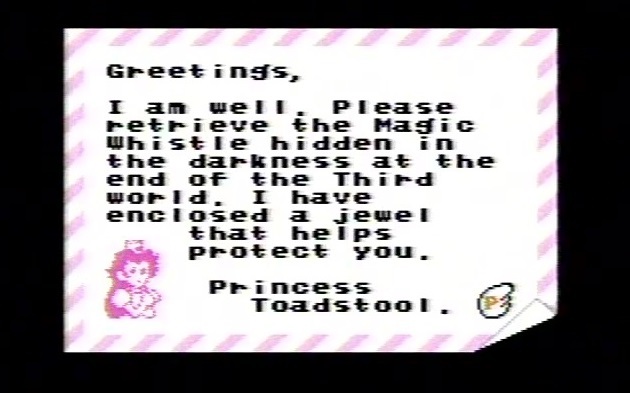 In the game of Super Mario Bros. 3, there are magic warp whistles which we have covered in previous sections of this very lesson set. Later in the lesson set, we will get to the whistles more. We have covered the fact that these whistles can get us into a lot of trouble if not ready for the advancement in the game that they bring. The three things that God wants to equip us with this time and in our lives is discernment, experience and wisdom. Just because we are saved doesn't mean that our journey is over–it's just the beginning. If you have played Super Mario Bros. 3 a lot before, you'll know these are bad directions in the letters. 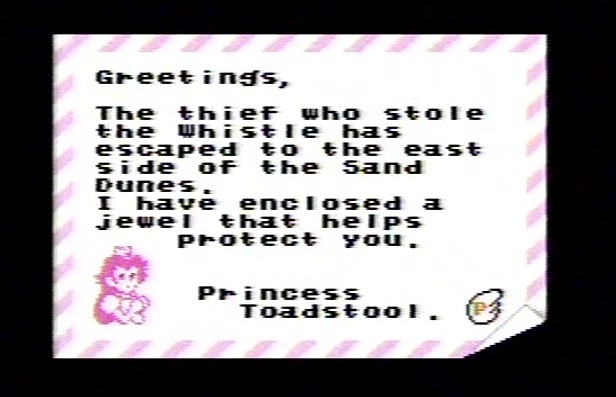 The first one is between levels 4 and 5; it's talking about a whistle hidden in level 2 ((Desert Land). This message is two levels too late to help in this game, so you would have to play again in order to get it and even then it's well hidden. 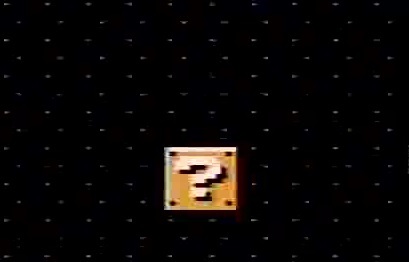 The second letter is between levels 6 and 7 and is even worse because it talks about a whistle at the end of world 3 (Water World); the closest thing is the darkness at the end of World 1-3, which is inside Grass Land (level 1). A lot of our Christian walk is going to take time. As we mature in Christ, we will have made many foolish decisions. Look at Philippians 3: 12-16 and then 1 Corinthians 1: 18-31. Php 3:12 It's not that I have already reached this goal or have already become perfect. But I keep pursuing it, hoping somehow to embrace it just as I have been embraced by the Messiah Jesus. Php 3:14 I keep pursuing the goal to win the prize of God's heavenly call in the Messiah Jesus. Php 3:15 Therefore, those of us who are mature should think this way. And if you think differently about anything, God will show you how to think. Php 3:16 However, we should live up to what we have achieved so far. 1Co 1:18 For the message about the cross is nonsense to those who are being destroyed, but it is God's power to us who are being saved. 1Co 1:19 For it is written, "I will destroy the wisdom of the wise, and the intelligence of the intelligent I will reject." 1Co 1:20 Where is the wise person? Where is the scholar? Where is the philosopher of this age? God has turned the wisdom of the world into nonsense, hasn't he? 1Co 1:21 For since, in the wisdom of God, the world through its wisdom did not know God, God was pleased to save those who believe through the nonsense of our preaching. 1Co 1:24 but to those who are called, both Jews and Greeks, the Messiah is God's power and God's wisdom. 1Co 1:25 For God's nonsense is wiser than human wisdom, and God's weakness is stronger than human strength. 1Co 1:26 Brothers, think about your own calling. Not many of you were wise by human standards, not many were powerful, not many were of noble birth. 1Co 1:27 But God chose what is nonsense in the world to make the wise feel ashamed. God chose what is weak in the world to make the strong feel ashamed. 1Co 1:29 so that no one may boast in God's presence. 1Co 1:31 Therefore, as it is written, "The person who boasts must boast in the Lord." Discernment is akin to wisdom; a lot of times dicernment comes after much prayer and is about what to do or where to go next and takes a lot of maturity and listening skills. Let's look at Philippians 1: 3-11 and then James 5: 13-16. Php 1:5 because of your partnership in the gospel from the first day until now. Php 1:7 For it is only right for me to think this way about all of you, because you're constantly on my mind. Both in my imprisonment and in the defense and confirmation of the gospel, all of you are partners with me in this privilege. Php 1:8 For God is my witness how much I long for all of you with the compassion that the Messiah Jesus provides. Php 1:11 having been filled with the fruit of righteousness that comes through Jesus the Messiah so that God will be glorified and praised. Jas 5:13 Is anyone among you suffering? He should keep on praying. Is anyone cheerful? He should keep reciting psalms. Jas 5:14 Is anyone among you sick? He should call for the elders of the church, and they should pray for him and anoint him with oil in the name of the Lord. Jas 5:15 And the prayer offered in faith will save the person who is sick. The Lord will raise him up, and if he has committed any sins, he will be forgiven. We have to be very sensitive to God's voice; remember the less of us in our faith walk, the more God will fill our mind with His messages. In other words, “Self kills Faith” and vice-versa. The more faith and trust in Christ instead of ourselves, the more God will bless our efforts in Christ. Don't try to control things, let God do that. Remember God blesses our faith and trust in Christ abundantly and our effort in Christ won't be in vain.